These words of travel wisdom have become my mantra since embarking on a 70-day adventure through Western Europe. With my first stop in London, suppressing my inner urges to plan my every move was one of the best decisions I’ve made. London is a city meant to be experienced, not planned for. Whether it was finding Chinatown neatly tucked behind Leicester Square’s theatre district or following the morning bells of St. Paul’s Cathedral to find a Sunday service accompanied by the City of London Sinfonia, the most memorable experiences were those that I stumbled upon. Unexpected discoveries often come hand-in-hand with the post-graduation rite of passage: backpacking. While some come to party, to shop or to get a taste of other cultures, my main purpose was to see great works of art that I’ve only previously seen in textbooks. But as I stood in awe before the half-bodied Greek gods and goddesses in the British Museum, I thought about the priest’s sermon at St. Paul’s that invited visitors to venture beyond listening to the beautiful music and eyeing the stunning architecture, and rather to interact with it and understand it. London is the perfect place to practice such skills. On the surface, it’s a fast-paced and seemingly unfriendly city. Just observe commuters traveling on the airless Underground subway during rush hour. Beneath this rough exterior lies a vibrant, fully alive and charmingly chaotic city that offers something new and unexpected around every corner. A stroll down an unassuming lane in Notting Hill led directly to the world-famous Portabello Market. This was exactly how I pictured the entire United Kingdom with charming coloured row houses lining both sides of the narrow streets. Complete with stalls, boutiques and fresh produce stands, this pedestrian haven was like a scene from Hugh Grant’s, “Notting Hill” – a refreshing change from the hustle and bustle of central London. 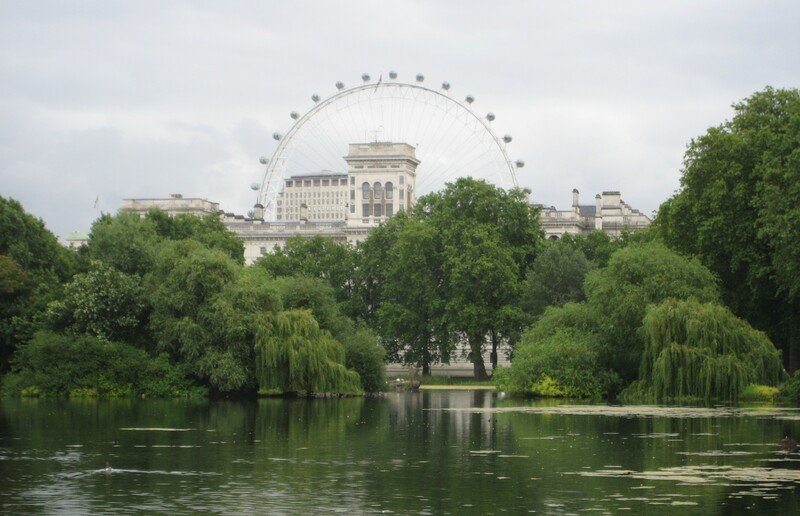 Gigantic parks throughout the city, such as Hyde Park, provided a surprisingly tranquil escape from the relentless crowds at Buckingham Palace and the Tower of London. Also with pubs on every corner, it was easy to take a break from seeing the sights. Fancy a snack of sausage and mash? Of course I didn’t travel all the way to London just to escape it. A walk down Oxford Street illustrated why London is one of the world’s top metropolitan cities. Not knowing that this area became a shopping mecca during London’s city-wide sale (usually around first week of July), I was pleasantly surprised to get a taste of consumerism at its best. As someone who generally avoids the mall during the Christmas rush, I wandered in awe through the mosaic of cultures, styles, ages and personalities that came together in England’s capital. It’s true that people make the city. And London’s unique character was nowhere more apparent than in the Underground. In addition to being the preferred way to get around, it offered the perfect cross-section of life in the city. In the early hours of the morning, the tubes were packed with people, jammed like sardines into a can, warm and sour smelling. This discomfort was quickly overcome by good-natured drunks, travelers and locals, all chattering, singing and laughing while recapping both the day and night out on the town. Whether it was with friends or someone I just met, a ride in the tube encapsulated what backpacking is all about: meeting people from all walks of life, sharing a drink or two and experiencing all that London has to offer.